A brave police officer suffered a 5cm knife wound to his arm as he tried to check on the welfare of an older man. Arnold Tracey, 59, brandished a dirty kitchen knife and shouted: “I’m going to get you” as the PC broke the lock to his flat following neighbours’ concerns. Preston Crown Court heard Tracey previously lost 22 stone after having a gastric bypass, but developed psychological problems, rarely leaving his home. He lunged at the officer with the knife above his head, slicing through his fleece as the officer raised his arms in defence. The officer had to be taken to hospital for treatment and a tetanus injection. 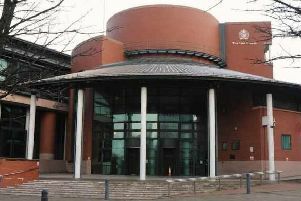 Prosecuting, Jacob Dyer said officers went to Tracey’s home at The Martindales, Clayton-le-Woods, Chorley, on February 25 on a welfare check as his TV had been on for two days, and the officers broke the lock. When Tracey lunged at the PC he was Pava sprayed by his colleague and restrained. Jailing him for 14 months, Judge Robert Altham said: “This was a uniformed police officer bravely going about his duty with nothing in mind other than protecting this defendant. Police are entitled to expect that when someone gratuitously attacks them with a knife they will face a proper sanction.